Tendinitis is defined as Inflammation of Tendons. Pain, swelling, limitation of should movements, muscle atrophy (Supra + Infra spinatus), tenderness over greater tuberosity etc. Grade 1– is common in young adults and athletes age group of 18 to 30 years. 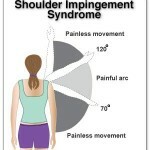 Due to over stress, repeated over head activities, impingement. Pain occurs in impingement syndrome between 40-1200 of should abduction as in this position supraspinatus. Tendon impinged against under surface of acromion and head of humerus. Movements are painful (Painful arc syndrome). Grade 2– Seen in age group 40-45 years due to supraspinatus tendinitis or sub-acromial bursitis. Cause could be over use, degeneration and osteophyte formation. Grade 3– Seen in age group > 45 years of age group due to occupational over use, fall, sudden increase in activities, atrophic degenerative changes in the cuff. Thermotherapy. Ultra sound, SWD and Tens for reducing pain and spasm. Passive mobilization. Relaxed full ROM. Gradually resisted exercises help to strengthen the abductors.